and have you wanting seconds? I can tell you I did have a second serving of everything on this plate! And...I don't feel even the slightest bit guilty. 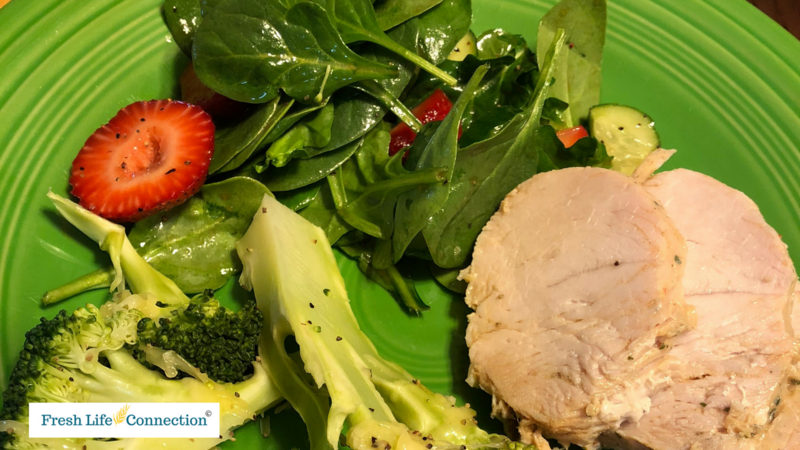 The salad was so fresh and flavorful, I grated fresh parmesan cheese on the broccoli and baked a ready to bake turkey tenderloin. It was so good I'm glad I have half of the tenderloin left over for another meal! I wrapped the tenderloin in foil and closed it up tight. Then I lined a baking dish with another sheet of foil just in case it leaked, and it did so I'm glad I thought of that. Because I did this extra step I didn't have any clean-up from baking the turkey. Bake it at *325 for 45-50 minutes or until the internal temp reads *160. Remove it from the oven and loosen the foil while leaving it covered and let it rest for 10-15 minutes. Next, I mixed fresh baby leaf spinach, prewashed, with an English cucumber and half a dozen strawberries. I made a raspberry dressing using raspberry flavored vinegar and extra virgin olive oil. Depending on how tart you like your dressing I make this around 3-1. That is 3 times the vinegar to 1 part oil. I always steam my broccoli. When it is just getting tender it's done. After putting it in a serving dish I grated fresh cheese on it. I then ground fresh pepper on both the salad and veggies. Everything was so fresh and with 0 bad calories, there was no need to feel guilty about eating a second serving. All I can say is yummm.... and of course, I hope you give it a try! Bummed that you grabbed another unhealthy choice to eat? You are not alone...Join Our Community for support and ideas on eating healthier for every meal of the day AND get a FREE 20 Healthy Snacks list!